What Does a Pet Food Sales Representative Do? Pet food sales representatives use their knowledge of animal nutrition to market pet food products to retailers. Pet food sales reps may specialize by offering products for one specific species (such as dogs, cats, or parrots), or representing one specific product or company. Pet food sales representatives are responsible for marketing a pet food manufacturer’s products to dealers such as local pet stores, major chain outlets, and veterinary clinics. They work under the direct supervision of a sales manager. 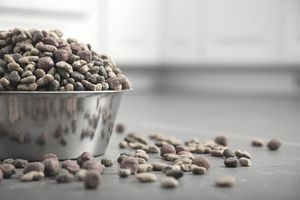 Pet food sales reps must stay current with developments in the field of pet nutrition and constantly educate themselves about the needs of the industry and their company’s product line. They must also aggressively seek out new clients and expand their sales volume in a designated territory. Sales representatives are generally required to keep detailed records of their sales performance, develop lists of potential prospects, schedule visits to retailers to make sales presentations, keep track of accounts, file expense reports, and provide customer service to existing clients. Compensation for pet food sales representatives can be based on salary, commission, or, frequently, a combination of both. Sales reps also usually receive some sort of bonus incentive for the achievement of sales goals and other outstanding performance milestones. Representatives that work in a field sales environment often receive several forms of additional compensation, such as an expense account for entertaining clients, paid travel expenses, and use of a company vehicle. Pet food sales representatives can come from a variety of educational backgrounds. An advanced degree (Masters or Ph.D.) is preferred for those in supervisory (sales manager) roles. Direct experience in working with targeted species is also valuable. Education: While there is no specific degree required for this career path, most pet food manufacturers seek representation from candidates with a degree in marketing, nutrition, communications, animal science, business, or a veterinary related field. Training: New recruits for sales rep positions usually go through a comprehensive training program upon being hired. These training programs can last anywhere from several weeks to several months, depending on the preferences of the pet food manufacturer. They may also be assigned a mentor to shadow in the field before striking out on their own. Professional development: The sales management team also endeavors to provide continuing education for the representatives so they can be well informed about new product lines that are being developed and marketed. Customer service skills: Pet food sales reps must listen to and address the clients' needs before and after sales. Interpersonal skills: Pet food sales reps must be able to build good working relationships with clients and team members. Confidence: Selling involves a certain level of self confidence and composure, especially when working with brand-new customers. The U.S. Bureau of Labor Statistics projects that employment in the general field of manufacturing sales will grow 5 percent through 2026, which is slightly slower than the overall employment growth of 7 percent for all occupations in the country. However, the pet marketplace was a $72.56 billion dollar industry in 2018 and continues to grow each year, according to the American Pet Products Association. That means earning potential should be solid for those able to find positions in this fast paced sales environment. There are two types of sales rep positions: inside sales and field sales. Inside sales positions do not involve any, or extremely minimal, travel. Sales calls to prospects are made by phone and can be done from home or an office. Field sales positions usually require frequent travel throughout a specific territory. Participation in industry trade show events or conventions may also be a part of the job. Because a large amount of their income and success in a company depends on how much they sell, pet food sales reps may find themselves under a considerable amount of stress. People in this occupation need to be able to effectively handle this type of pressure. Successful sales representatives may be able to advance to positions of greater responsibility, such as regional sales manager. Most sales representatives work full time, according to the BLS, and many work more than 40 hours per week. Work schedules can depend on both the employer and the schedule of the companies to which they're selling the pet food, as well as whether or not reps work in the field. There are several membership groups that those involved in the sales industry can join. Belonging to them may help give you an advantage over candidates and connect you to possible job opportunities. The American Pet Products Manufacturer’s Association (APPMA) is a leading group for pet product sales representatives. This trade association conducts market research, provides educational seminars, and puts on the Global Pet Expo each year. One well-known group for sales representatives is the Manufacturers’ Agents National Association, which offers market research studies, continuing education opportunities, and local networking events for manufacturers’ agents. The Manufacturers Representatives Education Research Foundation, offers certification for sales representatives as either a Certified Professional Manufacturer’s Representative (CPMR) or as a Certified Sales Professional (CSP).